Home / dog breeds / What are the Best Dog Breeds for Families? 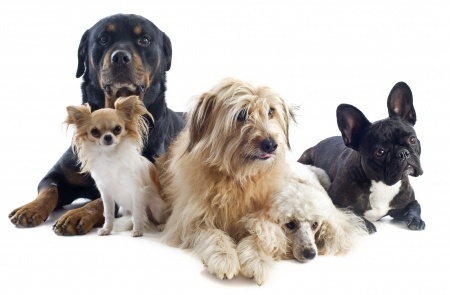 What are the Best Dog Breeds for Families? Thinking of adding a new furry family member to your pack? Good for you! What kind of dog do you want? A high energy – “I want to run 5 miles a day” – kind of dog to keep up with you on your daily runs or would a lounging breed like a Newfoundland be a better match? Every year, people adopt a new dog without giving it enough thought about how that pooch will fit in – or not fit in – to their lifestyle. Several thousand of those dogs end up at the shelter because the families weren’t prepared for the major lifestyle adjustment a dog can bring into their lives. Depends on factors like how much space you have and primarily, how much time you plan to give to a dog. But first, ask yourself this: Do you want a puppy or is an older dog a better fit? Puppies – of all breeds – have lots of energy, require training and will go through a period of chewing everything in sight. You’ll need a profusion of patience, plenty of time to exercise them and probably a dog trainer for a few weeks. Older dogs may be able to settle in within a few weeks or a couple of months. There will still be a “get to know you” period but they may already understand basic “house manners” such as bathroom expectations. Which you use is up to you. Either way, there are lots of great dogs at the shelter and the staff can help you choose one with a good temperament for you and your family. If you live in a city want a dog that will fit well with your lifestyle, here are three ideas. Boston Terriers — They’re loyal, quiet, and don’t require a lot of exercise. All top considerations if you live in a small space. English Bulldogs – Also quiet, low maintenance, and don’t require laps around the local park. Bulldogs would usually rather flop somewhere nearby and receive your attentions. They’re good with kids and have lots of patience. Pugs could be a good choice too. They’re friendly and quiet. If you enjoy hiking and have a nice-sized yard – rambunctious, primary school children who love throwing balls are a bonus – then Golden Retrievers, Labradors, and Collies can be good fits. Goldens and Labradors are loyal and patient. They also love to play. So if you have children who’d enjoy romping outside with them, this can be a great match. They do require a lot of exercise – especially when they’re young. We met an 8 year old Golden/Lab mix over the weekend that dog made the rounds the entire party without showing any sign of slowing down. Great personality but not for people who aren’t home much. Collies are smart and active. If you think of “Lassie,” you know this is another breed who is “go, go, go.” Do you have the lifestyle for endless games of fetch and/or walks? Newfoundland – This giant breed is perfect with kids of all ages. “Nana” in Peter Pan was a Newfie and in real life, they live up to their reputation as a reliable baby sitter. Better yet, if you have young children or otherwise find yourself short on time, they’re loyal couch potatoes. Playing fetch and endless long walks aren’t high on the Newfoundland’s list of fun activities. If your heart is set on a higher energy breed, but you live a more sedate lifestyle, you may be able to make it work with regular doggie day care. As the saying goes – a good puppy is a tired puppy and nothing tires out a puppy more than hours of high energy play – even if that “puppy” is 6 or 8 years old. The best thing is to talk to people who have the type of dog you’re considering and think it through. What do you think? What kind of pup will you get?